Looking to throw the ultimate Tailgate Party where everyone can have a great time? 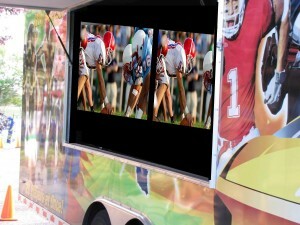 Let Gaming Fanatics Video Game Truck change your party into an event! First, we bring our limousine styled video game theater to your home or even to the parking lot of the big game! Inside, we provide stadium seating for 26 with a high-tech sound system and five 50″ HDTV’s. Outside we have two more HDTV’s that adds another 8 guests playing video games at the same time! Here’s where the tailgate party becomes an event...Our rig is equipped with a high-definition satellite dish that gets the very best sporting events. We can display that game on one or all of our TV’s…it’s all up to you! And because it’s HD (where games are available), you get that living room feeling while making it a tailgate at the same time. Before, during and after the big game, you and your guests can play the latest multiplayer video games on Xbox, Wii, Wii U and Playstation. Worried about video game ratings? Don’t be! We understand the importance of providing appropriate games for your party. When you book your party, you select games for your guests. You don’t need to worry or compromise; it’s our policy. We’re available in and around the greater Dayton, Ohio area. More than 35 miles from us? We charge a slight fee to cover our mileage. See our Service Area for more information. And, best of all, with Gaming Fanatics Video Game Truck, there’s no stress and no mess! We make having your next tailgating event almost effortless.